So, this is Experiment No. 2 in blending along with Mandy Aftel’s book, Fragrant. Earlier I created her solid Amber Spice perfume, and now I’m exploring those same notes in oil-based and alcohol-based versions. 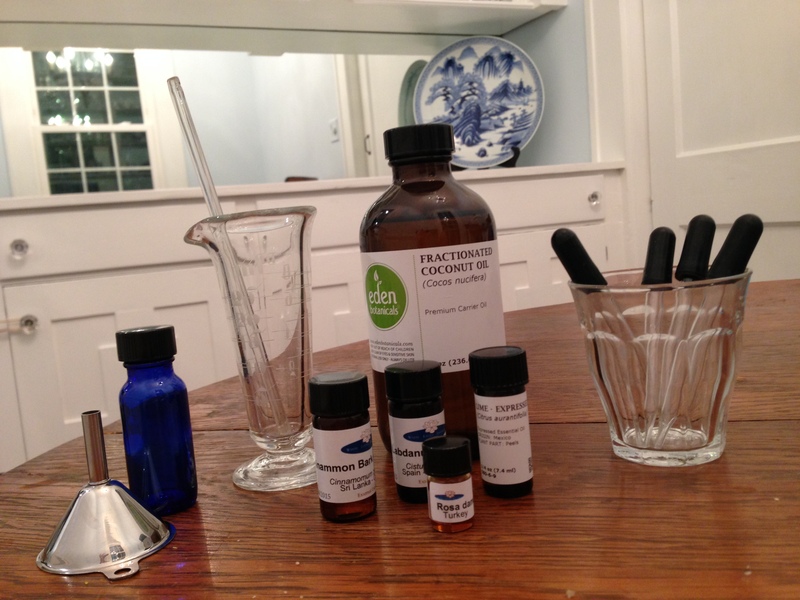 Supplies for creating the oil-based version of Amber Spice perfume. Measure out the fractionated coconut oil into the graduated beaker. Add the essences (using a separate eye dropper for each one), and stir after adding each one to mix well. Use the tiny funnel to transfer the blend to the bottle. Seal tightly, label with the name and date, and let it age for at least a couple of weeks to let the scents marry. It was incredibly easy to make the oil-based perfume. After aging only about a week (I haven’t been able to wait long!) it smells about the same as the solid version of the same perfume – an initial impression of “cola” (lime + cinnamon) followed quickly by leathery labdanum. This isn’t very surprising since the oil-based perfume uses the same essences in the same proportions as the solid. The fractionated coconut oil absorbs into the skin relatively quickly and smoothly. Still, I find the projection for both these sorts of perfumes to be relatively weak, and for some reason applying the oil-based perfume – while fine – is less enjoyable than applying the solid perfume. So, if I want to make a skin scent in the future, I’ll probably stick to a solid perfume format. Still, you can’t beat this recipe for ease! Supplies for making alcohol-based Amber Spice perfume. Add each of the essences into the spray bottle, using a separate eye dropper for each one. Start with the bases (benzoin, vanilla, labdanum), then add the heart notes (rose, cinnamon, jasmine), and then the top notes (ginger, lime, bois de rose). Smell after each addition to experience how the blend is progressing. 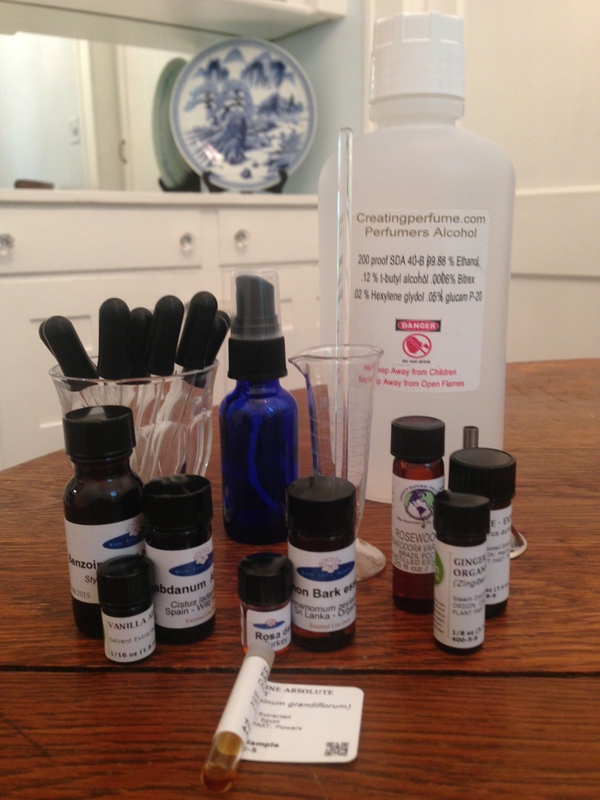 Measure out the perfumer’s alcohol into the graduated beaker, then pour it into the spray bottle with the essences. Seal tightly, label with the name and date, and let it age for 4-6 weeks to let the scents marry. This recipe was *a lot* harder to pull off than the solid perfume and the oil based perfume because it uses two really challenging natural materials: Benzoin and Vanilla. These materials are solid to semi-solid, and very hard to work with undiluted. Fortunately, I had the good sense to purchase Benzoin absolute that had been diluted to 50% in alcohol, so I was able to add it in drops. Still, this left me puzzled as to how many drops to add. Should I double the drops since it was a 50% dilution? I assumed so, and did. But what about the vanilla? It had the consistency of tar – thick, gooey, and totally impossible to get at with an eye dropper. I tired warming it gently by placing it in a bowl of hot rice (you should never microwave essential oils). This made it slightly more liquid – and I was just barely able to use the eye dropper to add it to the blend. Still, I don’t think I added an accurate amount of vanilla – it got everywhere! In the future, I think I’ll either need to buy prediluted Vanilla absolute or dilute it myself by 50% (by weight) before working with it. Which means….I need to purchase a scale. As for how it smells…well, it only has aged for 1 week, and quite honestly it smells like cream soda. I may have OD’d the benzoin and the vanilla. Sigh. I need to try the recipe again with less of those base notes. Still, it smells delicious (if you want to smell like a cola float!) and reminds me of those Bonne Bell lip smackers from the 70s when I was a little girl. The scent is also much more complex and layered than the oil or solid perfume with better intensity and longevity too – so I think I’m hooked on using alcohol as a carrier medium for future blends. Confused about the dilutions, I reached out to Mandy to ask her how to handle the viscous/semi-solid vanilla, benzoin, and fir absolutes she uses in her recipes. She was kind enough to get back to me, and explained that she doesn’t dilute them. Instead, she uses them at 100% strength, and uses a tiny bamboo ear cleaner to scoop out the material and add it to the blend.